Vous pouvez également utiliser 13200 Kobo Super Points pour l'obtenir ! Admiral Hyman Rickover personally revolutionized naval warfare and altered the outcome of the Cold War. Concurrently he drove innovation into American industry -- which in the decades since has proven to be a wellspring of power for American technology. As a touchstone of his success, during Rickover’s stewardship the Russians had literally dozens of reactor accidents, but Rickover’s single-minded focus on safety protected Americans as well as and our lands from nuclear contamination. Rickover did all of this initially by the force of his own personality and eventually by insisting on radical culture change. The author had the good fortune to personally know and be involved with Admiral Rickover as well as many of the most interesting players and protagonists during much of this thirty year process of wrenching cultural upheaval. The author leaves detailed biographical details of Rickover to others, instead focusing on previously unknown historical events in which he personally participated or had unique knowledge which highlight the management and leadership principles behind Rickover’s achievements and place important events (President Eisenhower choosing nuclear submarines to counter Sputnik, development of the Polaris Fleet, the relationship of Admirals Zumwalt and Rickover, the loss of USS Scorpion, the superiority of the American submarines over the Soviet fleet, etc.) in an historical perspective. 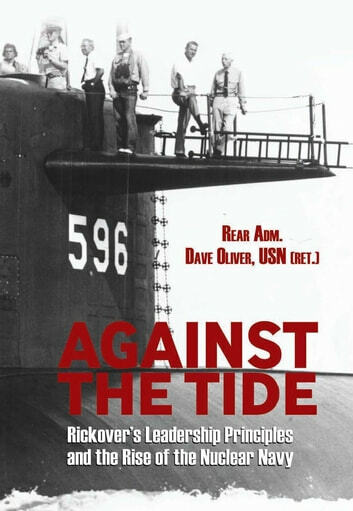 Because of his life’s work, the author is uniquely qualified to apply many of Rickover’s principles to other situations. For example, Dave well understands the particular navy culture Rickover had to destroy for the author began his own career on a diesel boat. Similarly since the author spent a decade in US industry as either the Chief Executive Officer or the Chief Operating Officer, he understands how to identify situations where Rickover’s principles can be applied to industry circumstances. This is done at the end of each chapter in the book, thus providing a starting point for any who wish to use this source for case studies.